FileBot now has it's own Package Source so you can download and install FileBot conveniently from the Package Center like any other Synology package. This package will install and run the FileBot Node web application. You will be able to execute, schedule and monitor filebot commands with a simple Synology DSM UI. 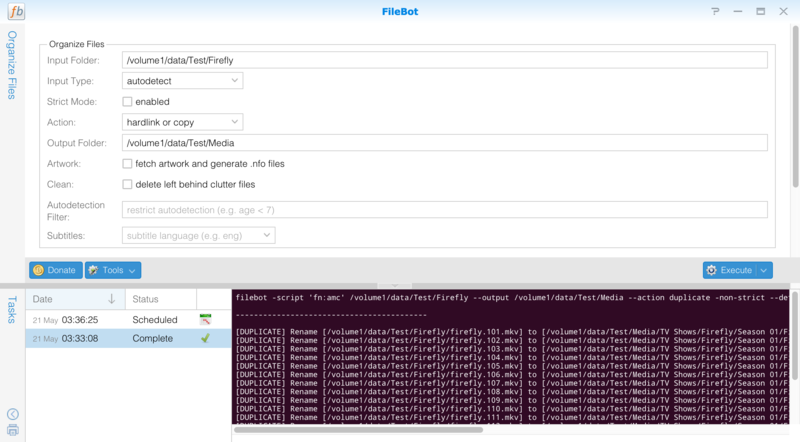 FileBot Node requires node. You will need to install the latest Node.js (Node.js v4 recommended) package. If you process music, you need to install MediaInfo and Chromaprint. If you use mediainfo bindings in your format, you need to install MediaInfo. Java 8 is required. My Unofficial Java Installer package will help you install the latest Oracle JDK. Running commands from the login shell is not the same as using Synology DSM Task Scheduler or cron because they'll not initialise with ~/.profile so keep in mind that $PATH will be different. If you want support for MediaInfo and AcoustID you will need to install the MediaInfo and Chromaprint packages from SynoCommunity. FFprobe can be installed via the official Media Server package. Media Server: ffprobe is required for reading video/audio information from media files. MediaInfo: libmediainfo.so is required for reading video/audio information from media files. Chromaprint: fpcalc is required for computing acoustic fingerprints and matching music files with metadata.